Mike tells us that he has been collecting various maps all of his life as a hobby. He has been good enough to share this one with us so we may learn more about the areas our ancestors came from. I will try to add them as they become available to study and for our children to print out and paste in their book reports. This is a German map of Yugoslavia made 1940. The yellow parts of the map show where the Serbs lived. 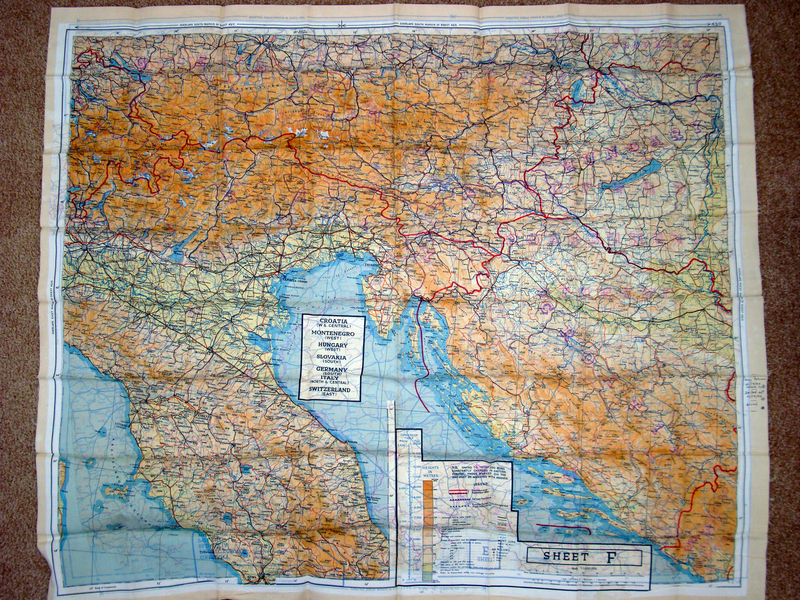 Here's an image of a silk map from Ted Connolly, the son of U.S. airman +Tom Connolly, one of the 513 rescued American Airmen saved by General Draza Mihailovich and his Serbian Chetniks, our American O.S.S., and incredibly brave American rescue pilots in "Operation Halyard." Rare 18th Century Book Donated to Hilandar Research Library! The 1796 Proclamation of Maria Theresa, Empress, Regarding Protected Religious Rights of the "Illyrian" Minority in Austro-Hungary! This extremely rare book in 19+5 leaves is written in Russian Church Slavonic with South Slavic (Serbian) features and describes the continuation and clarification of the rights of the Orthodox minority population that arrived in Austro-Hungary in 1690 (The Great Migration of the Serbs). This book was donated to the Hilandar Research Library by Prof. Dr. Jos Schaeken, Professor of Balto-Slavic Languages and Cultural History, Leiden University, The Netherlands. For more information on the Hilandar Research Library, click above link. The Hilandar Research Library has the largest collection of medieval Slavic manuscripts on microform in the world. Just some advice from the book: THE OZ PRICIPLE. You either get stuck or you get results. Just one principle. That's all. "What ELSE can I do to make a difference?" ACCOUNTABILITY; Continuous improvement, innovation, customer satisfaction, team performance, talent development. No "victimization" to justify inaction…. When his army reached the coast of what is now called India, he ordered his me to burn their ships. When the men hesitated at such a shocking order, Alexander's response was, "We're either going home in their ships or we're not going home at all." In other words, burning the ships would cement his army's commitment to conquest because retreat would cease to be an option. Now victory could become the sole objective. Mike also sent us a few book websites to add to our collection for young researchers. One of the BEST library collections on Serbian History can be found at the Joe Buley Library in New Gracanica, Third Lake, IL. Presently, the library features 8,000 catalogued books plus periodicals and other holdings. This was done with the great work of librarian, Dr. Nicholas Groves, M.A.L.S. and Fr. Serafim Baltic, Assistant Librarian. You will love some of the features of the Newberry Library in Illinois. If you search their catalog for Serbian items, you can read some of the old books right on line! What a treat it was to read right from my computer here at home about WWI and the English Serbian Relief Committee, and see the illustrations and photos of the people from that war. "Here is a feature coverage story regarding the late Mitchell Paige who died Nov. 15, 2003. Mitch+, an American Serb, was a Medal of Honor recipient from WWII with unbelievable exploits."